We love showing you new products, and especially new tools! If you want a tool with versatility and strength that will assist in getting the job done on the fire ground, The Paratech Buster Tool is one to check out. This is a low-damage forcible entry tool meant to help you reach incapacitated victims before assist units arrive to the scene. The Buster Tool has three claws: Compact, Standard and Cutting. The Compact Claw will pry windows, light door frames, enlarge opening in sheet metal and pull nails. The Standard Claw will do all of the above and can be used for gas shut off, prying open larger doors and removing hinges from doors. The Cutting Claw is perfect for cutting through sheet metal. Its unique locking lever allows the tool to be used in two positions: closed for use in compact spaces or extended and locked for added leverage. When the claw is completely removed it can be inserted in the keyway in the axe head for twisting leverage in confined spaces. While unlocked, the Buster has the ability to "Slam & Ram" as we say, to make a powerful, quick and decisive entry. The assembly and construction is built tough--the head and claw assembles are separate sections manufactured from hardened stainless steel for maximum strength. The handle is ergonomically designed and shaped to give you a great grip. 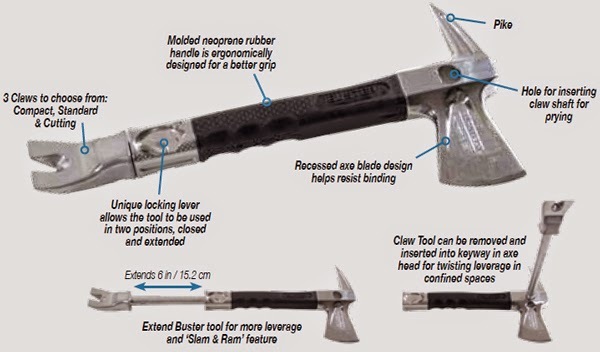 Don't wait--Get your Buster Tool TODAY!